Two weeks ago, I would have told you that I was jealous of my friend*. That her life was perfect and that she had it all together. That her marriage was happy, her child was perfect, and everything had gone and was continuing to go exactly how she had planned it. She was the mom that I envied, that I compared myself to when I was in the weeds. What would she do in this situation? How would she have handled this better? She is potty training her kid? What is wrong with me and my kid that we haven’t even started that yet? And then we met for coffee. She laughed at me when I told her my assumptions. “No, no no no. I have no clue what I’m doing. Don’t do what I do.” We laughed, talked about other things, and went about our lives. She went back to work and I went back home and started dinner while my daughter sat at my feet begging me for chips. Chips, you better believe my friend would never give her child chips. It was somewhere between that third and fourth potato chip that it finally hit me. I have been comparing my entire life to half of someone else’s story**. Facebook, Instagram, and the 24/7 flood of “look at me and how great everything is” makes it almost impossible not to do it. All we are seeing is the best side of people, their projected image of their life. Then we take all the parts of our life and compare how we are doing. Happy day at the pumpkin patch. No irony here. We don’t share the pictures of the screaming at the top of their lungs temper tantrums, the sleepless nights, the jealousy we feel when our husbands go out for a night with their friends while we stay at home and watch another two hours of Mickey Mouse Clubhouse. 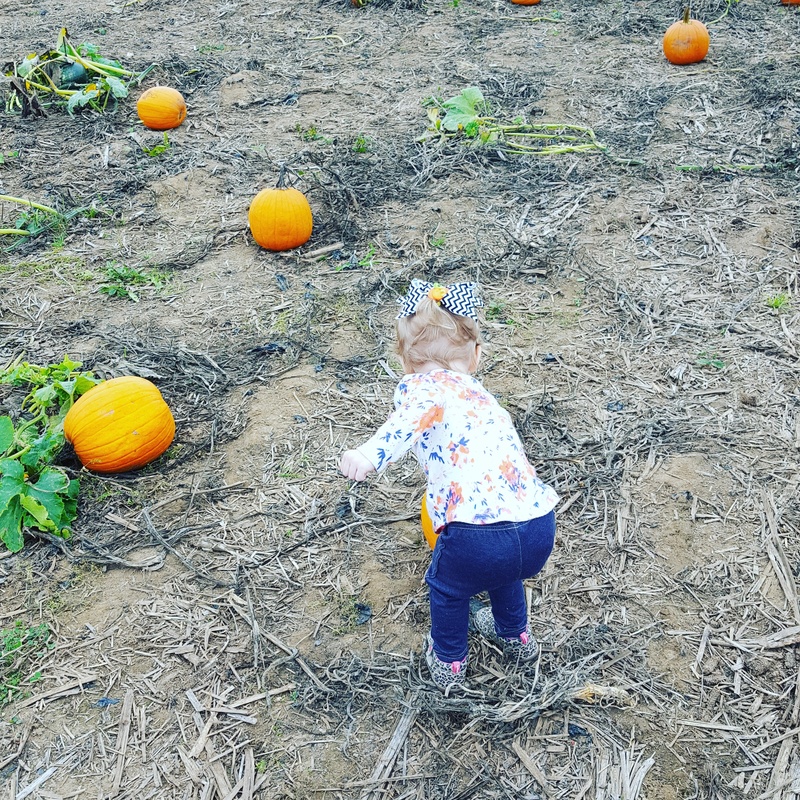 We share the pumpkin patch pictures, the happy faced child in her ballerina outfit, and the home-made-free-range-all-organic-chicken soup pictures. And we compare our entire lives to those brief glimpses. Recently a mom I met online shared that she was feeling particularly terrible about how she parents. She complained that everyone she knows is doing it so much better than she is. That she has friends with multiple kids that work and go to the gym and have spotless houses and manage to get their kids to soccer on time. There she is with just the one child, no career outside the home, and can’t seem to manage any of it. And, why are some people so much better at this than others? I immediately thought of my friend. Even the people that seem like they have it all together, don’t. At least, they don’t think that they do. Maybe it’s just that they show the best side to the rest of the world. Maybe it’s that the things that we fail at seem so much bigger than the things that they succeed at. Maybe we’re own worst critics. I decided then, in that minute, that parenthood pushes us all overboard. For the most part we all start out on the boat, dancing and having fun. Then come the kids, the boat shifts, and we all go into the drink. We’re all in bad shape once we hit the water, but some of us are better swimmers, or at least more graceful. Yeah, in the beginning we’re all drowning and swimming for that life boat. Some of us do it with grace, some of us flail around for a while, but we are all outside the boat and trying to get back in. Some of us just get there faster. So my message to other mom’s is this, don’t judge yourself based off of what other moms are doing. Maybe it seems like everyone else is doing the breaststroke while you’re helplessly doing a doggy paddle. Maybe you can’t even see the life raft. Maybe you’ve decided that you are staying right where you are and the boat will just have to come to you, thank you very much. Parenting is all about survival mode. We’re all doing our best. It doesn’t have to be pretty or perfect or Instagram worthy. Our kids just have to be clean-ish, fed, and loved. That’s our job. Well that, and to find a way to be happy with how we’re doing, and if we can’t manage that, figure out what we can do to make ourselves happier. Parenting is hard- the kids, the responsibilities, the mountains of laundry that seem insurmountable, let’s not go borrowing any more trouble. We have enough to worry about just trying to get back to the boat. *I say “friend” and talk about one instance but this is actually a combination of a few of my friends that I admire and look up to who are kind enough to remind me that they don’t really know what they are doing sometimes either. **Not that anyone has ever accused me of knowing what I’m doing or being the gold standard but I just want to state for the record that I have no goddamn clue what I’m doing either. Despite any well-lit, heavily filtered, Instagram photos you may stumble across.